It’s all about getting real with yourself and others. Transparently being yourself, even when you’re not who you want to be. Being aware that there’s something you’re feeling that’s fueling emotional eating and your need for calm. Authenticity helps you understand yourself in the present moment. There comes a point where you can’t lie to yourself anymore. You can’t justify what you’re doing, twisting your mind into all sorts of pretzel logic excuses. In the addictions community, it’s called hitting rock bottom. In the religious community, it’s called being who God knows you to be. In the business community, it’s called being straightforward and empathetic. 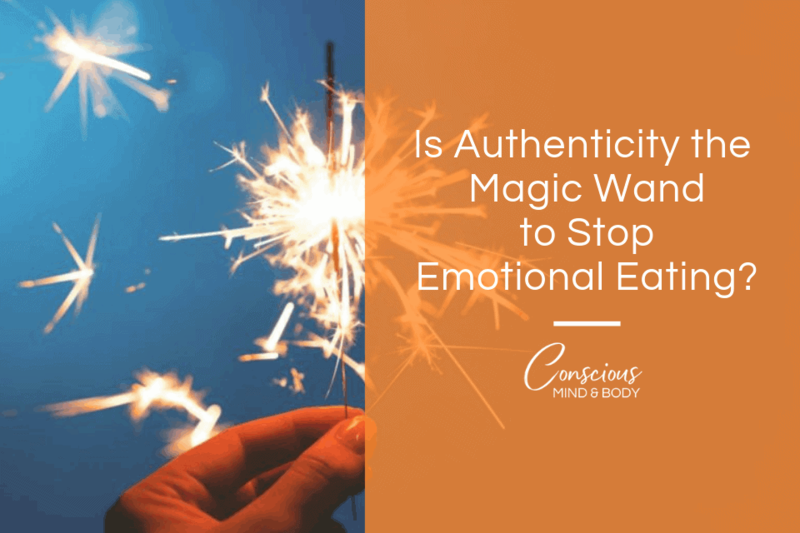 What if emotional eating is the struggle that happens when your authenticity with yourself, gets stuck and keeps you from knowing yourself and becoming a Conscious Eater? You lose sight of paying attention to your unique thoughts and feelings and instead go along with the stereotypical majority. After all, no one wants to be left out and the bigger question is, are you leaving yourself out of your equation? How can you make decisions that are in your best interests if you don’t know your own needs? What if you use the problem, emotional eating, to make sense of your unconscious wishes, desires, pain, etc. consciously you can use emotional eating for information. People like to eat food. It’s not about the food, except for when it is. Aside from the fueling aspect, we like the pleasurable, sensual experience of eating. The tastes, textures, memories, community and calming experience of eating. This is a good thing, this is part of Conscious Eating. It’s great to have an experience that is necessary and adds so much pleasure to life. Many of the women I work with, at one point or another, talk about the wish of taking a pill for total nourishment rather than having to deal with food. While this might sound nice in the short run, the real problem isn’t the food. Food is often associated with so many different and often conflicting messages. From the standpoint of authenticity, the food is just food. It doesn’t have any special properties beyond providing a source of energy. What we do, for a million different reasons, is associate memories and the feelings attached to it that shapes the experience of the food and ultimately yourself. People enjoy receiving pleasure from food. When you eat something pleasurable all sorts of good things happen in your brain. The reward centers say, “yes, that’s great, give me more!” You feel good. Maybe you experience less anxiety and feel calmer. Maybe you will feel better having had lunch with a friend and the focus isn’t so much on the leftovers from last night’s dinner that you’re eating, but the conversation, caring and sense of belonging you received by being in each other’s presence. Food is so much more than just nourishment of the body. It’s a multidimensional or multilayered relationship with your gender, your culture, your family, yourself. Authenticity is at first accepting and then exploring how the pleasure you receive from food works in your life. That’s not a cool conversation to have with yourself. It can only lead to all sorts of cover-ups and explanations about your behavior that lead you further from authenticity and even more stuck. When you allow yourself to enjoy and savor food, at least once a day, being mindful of your needs and you will feel satisfied. Food is nourishment in the fullest meaning of the word. If you’re able to accept that you like to eat, will it help you slow down the process of emotional eating? Will it help you know that you don’t have to use the excuse of emotional eating only when you feel out of control? You can slow down, allow yourself to experience your emotions, feel your feelings and leave emotional eating out of the picture. People want to feel good about their bodies. Most people, even if they have very little sense of vanity, want to at least feel good in their bodies, and look good! You want your clothes to fit well, you want to feel like your body is healthy and perhaps most of all you want to look pretty. What you don’t want is to be the subject to other’s judgments! Authenticity is about how your body aligns with your view of yourself right now. Some may say this is acceptance, but I hesitate. Acceptance often implies a fixed state of being and some would confuse this with giving up. That’s not the case. Acceptance is not trying to be someone or somewhere you’re not. Acceptance is looking at yourself clearly and knowing who you are today. Authenticity is stripping away the judgments, opinions, rules, etc. that keep you stuck, unable to move in the direction you need to go. How do you live with more authenticity in your relationship with food and your body? Challenge your judgments with curiosity about where they originate and if the judgment has a reasonable basis. Allow yourself to get more comfortable with the awareness that pleasurable experiences with food are natural, normal and healthy. It’s a very intimate relationship. And, when you allow yourself to work your way through your thoughts, feelings and memories, you can get to a new experience. An experience that allows you to see yourself clearly – authentically as you become a Conscious Eater.